Serratus Anterior Muscle - The Boxer's Muscle! What does serratus anterior mean? The serratus anterior muscle was named for its finger-like muscular origins that look serrated. “Serratus” comes from the Latin serrare meaning “to saw”. Anterior refers to the muscle’s location on the front or anterior side of the body. Serratus is known as the boxer’s muscle because it is the strongest protractor (sending it forward) of the scapula. This anatomical movement is primarily what allows for the whole movement seen in a punch. Where does the serratus anterior muscle attach? What actions does the serratus anterior muscle do? Protraction of the scapula – It brings the scapula forward on the rib cage. Upward rotation of the scapula – It is used after the humerus abducts to ninety degrees. Stabilizes the scapula and prevents the inner edge from “winging”. I often find that students don’t use serratus enough. I have written about it in a number of articles already that relate to Downward Dog, Headstands, Chaturanga, and Handstands. I’ve also written more about how we use the serratus anterior muscle in yoga postures, especially in arm balances, in my book Functional Anatomy of Yoga. Having said that, the serratus anterior muscle is a key stabilizer of the scapula and that is how it should be used in many yoga postures. The serratus anterior muscle upwardly rotates the scapula to get the arms over the head. The serratus anterior muscle contracts to keep the chest from sinking through the shoulder blades. In dhanurasana the serratus anterior muscle is lengthened as the scapula retract (get pulled back and together). This month David highlights the pubococcygeal muscles or PC muscles. 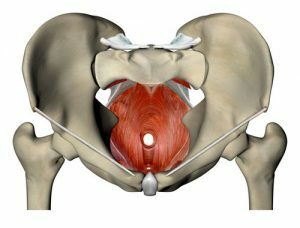 Learn where these pelvic floor muscles are found, what they do, and how they’re relevant to your yoga practice. How Much Is Too Much Yoga Practice Too Soon? David explains what it means to do too much yoga practice too soon and he shares some ideas on how to build your yoga practice without over-doing it. This month David highlights the multifidus muscles. Learn where these back muscles are found, what they do, and what yoga postures use them. Fantastic. Your article is very clear as usual. What do you recommend to someone with a winged scapula? I’ve been living with this pain for so long & only just recently been told it’s because I have a winged scapula. What pain are we talking about? Who diagnosed it? What is a winged scapula and how can the dysfunction ? be accommodated ? I have a personal question , i seem to have developed arms that are difficult to straighten, meaning I need a strap to do handstands without my arms collapsing out , I kind of gather some muscles need to lengthen and some I need to learn to activate and contract , to do the more advanced asanas without a supporting elbow strap. Glad you found your answer Mike! Actually, the upper left depicts the referral zone for trigger points of serratus anterior. 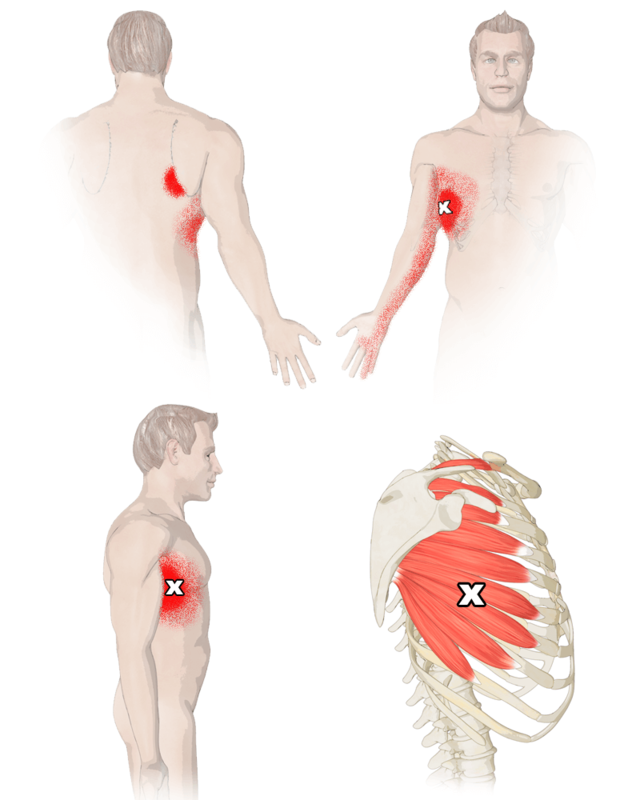 Head over to http://www.triggerpoints.net for other muscles that refer into the infraspinatus area. Tennis ball if it truly is THE infraspinatus that is the problem. Not sure what this has to do with serratus anterior… I guess you just landed here. I don’t have nearly enough information from you to give you any type of realistic answer. I prefer not to make specific recommendations this way either. Sorry for not being more helpful. Hi David. So your post on the serratus anterior muscle is from a while back, I hope you don’t mind my reply. I’ve got an injury on the serratus anterior muscle (I think), for I think the fifth or sixth time. This time it happened last Thursday, while catching (the calfs), I felt it stretch out to much. It didn’t hurt at that exact moment, I just felt it stretch to the max. It did hurt a short time later in sarvangasana though. And after practice, and for the next two days, I felt sharp pains in different movements. Right now, on Tuesday, the worst is gone but it still hurts like hell (as if a knife is stabbed between the ribs) in some movements. The things in asana practice that hurt the most (and the things I now avoid or modify as much as possible): jumping back, jumping through, stepping into virabhadrasana A from downward dog (only stepping into, the asana itself doesn’t hurt), marichyasana A and especially B both on the left side (my injury is on the left side), utpluthih, jumping out of bakasana (and jumping into, but that’s something I cannot do with or without pain, bakasana B is where I’m at in my practice) and sarvangasana also still hurts. Coming down from sitting position to lay down on my back, and the other way around, also hurts. It doesn’t hurt in backbending however. I can still do kapotasana without pain and catching (we keep it at the ankles now, to be safe). I do feel like the practice, as long as I be mindful of my movements and modify things, is helpful. I practice in the early morning, and definitely feel better afterwards than before (as long as I don’t push myself). I find it frustrating this injury keeps happening to me again and again. Every time I’m healed, or at least think I am, and when I get my strength back and finally can work on my jumpbacks (want to learn how to do it without the feet touching the mat) and since a few weeks jumping into bakasana, one – four weeks later I get injured again. What is it that gets me injured? Is it backbending? Cause it seems to happen most often in backbending. Though it doesn’t hurt that much in backbending. It hurts when I seem to contract the muscle or when there’s pressure on it. Could you give any advice? What can I do to prevent this in the future? How should I practice now as I’m healing? Thanks for reading this very loooong reply. By the way, got your book and I’m learning a lot (still reading the first half though, so I’ve got some more reading to do)! How does winged scapula effect the the breathing muscles in the thoracic area? I have a very bad left winged scapula. This was caused by a vaccine that hit a nerve in my humerus. After receiving the vaccine when I would lift up my left arm my deltoid would twitch rapidly and uncontrollably. At this time in my life I was a serious gym rat and mostly driven by my own ego… fax. I was lifting weights a lot more than i was doing asana and I didn’t pay much attention to the twitching. I believe I may have aggravated the injury worse by strengthening and mostly shortening an already irritated muscle group. Fast forward a few years and I now have and left trap muscle that never relaxes and sometimes yanks my head when I take a deep breath, not to mention sleep apnea probably caused by misalignment of my jaw. The good news is I have found much relief through yoga. How can I work backwards to loosen my throat (breathing muscles), neck and deltoid to realign my shoulder, c-spine and jaw hopefully curing myself of the sleep apnea ?